Which elicited precisely no response. So I actually had to do my own research. This is the hacked together results of that hour or so. Presented on the grounds that it may help others, as well as being an aide memoir for me. In general, linear representations of reference genomes fail (unsurprisingly) to capture the complexities of populations. It is almost universally the case, though, that the tools we have available to us work with precisely this type of reference. If we take the example of the human genome – since GRCh37 (Feb ’09), the GRC has attempted to represent some of the population-level complexity of humans by making alternative haplotypes available for regions of high complexity (the MHC locus of chromosome 6 is the canonical example). Church et al (2015) provide a more complete overview of the issues than I could hope to . Despite this recognition of the issues at hand, a flattened representation of the ‘genome graph’ is still predominantly used for downstream mapping applications. With GRCh38 having 178 regions with alt loci (as opposed to 3 in GRCh37), the need for an adequate toolchain becomes more pressing. Church et al points to a Github repo which is used for tracking software tools which make use of the full GRC assembly. I think the contents speaks for itself. I’ve found a few useful resources discussing the technology surrounding the use of a reference graph, as opposed to the flattened representation. Kehr et al (2014) discusses the different graph models available for building graph-based alignment tools . Though the focus on actual implementations is rather historical (the most modern tool referenced was released in 2011). More up-to-date is the work of Dilthey et al (2015), which looks at improving the genome representation of the MHC region specifically through the use of reference graphs and hidden Markov models . However, this work doesn’t seek to tackle a generic approach to read alignment to a genome graph. We do get a proposal for a useful graph model (the Population Reference Graph, or PRG) and a nice method for using data specifically in the MHC region, using HMMs. It’s also unclear to me (from my brief reading of the paper) how well this approach would scale. From the CS side of things, we get an extension of the Burrows-Wheeler Transform for graphs rather than strings from Sirén et al (2014) . This is an approach which would clearly allow the very popular transformation used so widely in short read alignment to be adapted to a graph-based algorithm. Then, finally, I came across an implementation. BWBBLE represents a collection of genomes, not using a graph structure, but by making use of ambiguity codes and string padding . Huang et al then rely on a conventional BWT to index this string representation of the ‘multi-genome’. This work also describes the implementation of an aligner that makes use of this genome representation. BWBBLE feels a bit ‘close but no cigar’ – it’s not using a graph to represent a population of genomes and no one is really using it. Finally, I get to the place where I actually started. HISAT2. I knew that this aligner was using graph-based FM indices to represent the genome (based on the work of Sirén et al mentioned above). I knew this made it possible to represent SNPs and small indels in the reference. I have no idea whether this allows HISAT2 to fully represent alt loci in its reference. Though from the descriptions available, it seems unlikely. I was pretty impressed by HISAT when it was released , but have yet to test HISAT2 in anger. HISAT was posited as the replacement for Tophat as an RNA-Seq aligner. HISAT2’s webpage makes it clear the developers intend it to be used over both HISAT and Tophat. It is not clear that any such thing is happening (STAR seems to be the de facto Tophat replacement in most people’s RNA-Seq toolchain, where they still rely on alignment, or are not still using Tophat). My perspective on this is one of a complete outsider doing about an hour’s worth of reading, but it seems to me that there is a complete paucity of tools allowing for alignment to a graph model of a reference genome. There’s plenty of discussion of the issues, and a recognition that such tools are necessary, but little so far in the way of implementation. I assume these tools are in the works (as I said, I’m an outsider looking in here, I have no idea who’s developing what). @TimWilliate @erikgarrison my sense is that in 3-5 years graph genome field will be like mappers were 3 years ago – dozens of offerings. I guess 3-5 years is a loooong time in genomics. implements alignment, succinct db of graph (sequences + haplotyps), text/binary formats, visualization, lossless RDF transformation, annotation, variant calling, graph statistics, normalization, long read aln/assembly, sequence to debruijn graph, kmers, read simulation, graph comparison, and tools to project models (graph alns and variant calls) into linear ref. (from a collection of tweets: 1, 2, 3, 4, 5, 6, 7, and 8). Jeffrey in the comments below also points out a presentation on Google Docs by Erik: https://docs.google.com/presentation/d/1bbl2zY4qWQ0yYBHhoVuXb79HdgajRotIUa_VEn3kTpI/edit#slide=id.p. Another tool to get a mention was progressiveCactus (see here). A graph-based alignment tool that seems to be under active development on Github. Last week a pre-print was published describing Kallisto – a quantification method for RNA-Seq reads described (by the authors) as ‘near optimal’. Here is Lior Pachter’s associated blog post. 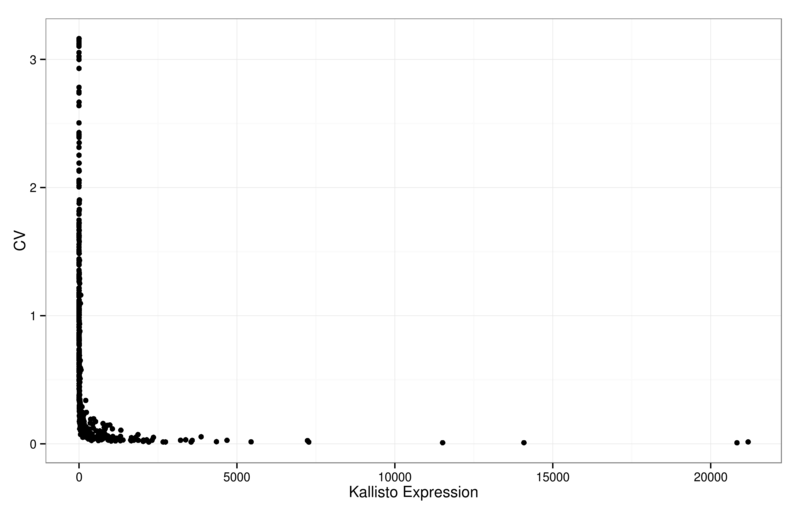 Kallisto follows a current trend for ‘alignment free’ quantification methods for RNA-Seq analysis, with recent methods including Sailfish and it’s successor, Salmon. These methods do, of course, do ‘alignment’ (pseudo-alignments in Kallisto parlance, lightweight alignments according to Salmon), but they do not expend computation in determining the optimal alignment, or disk in saving the results of the alignment. Making an alignment ‘good enough’ to determine the originating transcript and then disposing of it seems like a sensible use of resources – if you don’t intend to use the alignment for anything else later on (which usually I do – so alignment isn’t going to go away any time soon). I’ve been using Salmon for a few months now, and have been very impressed with its speed and apparent accuracy, but I felt that the publication of Kallisto means I should actually do some testing. What follows is pretty quick and dirty, and I know it could well stand some improvements along the way. I’ve tried to document the workflow adequately – let me know if you have any specific suggestions for improvement. Initially I wanted to run the tests with a full transcriptome simulation, but I’ve been having some technical issues with polyester, the RNA-Seq experiment simulator, and I haven’t had the time to work them out. So instead, I am working with the transcripts of a sample of 250 random genes. Reads were simulated for these transcripts to match empirically observed counts from a recent experiment. This simulation gave me a test set of 206,124 paired-end reads for 1,129 transcripts. This data set was then used for quantification with both Salmon (v0.3.0) and Kallisto (v 0.42.1). I then ran the quantification with each tool & each set of reads 10 times, to get an idea of the variability of the results. For Salmon, this meant 10 separate runs, for Kallisto it meant extracting the HDF5 file from a run with 10 bootstraps. For interest, I tracked the time and resource use of each tool, though this is not a big consideration. Since we are now in the place where most tools operate in minutes per sample (alignment via STAR or HISAT, and these quantification methods), a few minutes either way is going to make a negligible difference, and speed is usually entirely the wrong metric to focus on. For the record – Salmon took a lot longer for this experiment, though the requirement to keep counting reads until at least 50,000,000 have been processed (by default, configurable through the -n parameter) accounts for the majority of the time discrepancy & would not be such a ‘penalty’ to operation with a normally-sized experiment. The two graphs below show the coefficient of variance for the observations by each of the software tools, vs the raw read count. In both cases, the transcripts with low base mean exhibit the largest relative variance – this is hardly surprising. In general, variance is proportional to mean expression. For comparison, I took the mean observation from the 10 runs of Salmon, and the final abundance.txt observations from Kallisto, and compared them to the ‘ground truth’ – the count table from which the simulation was derived. Plots of these comparisons are below. 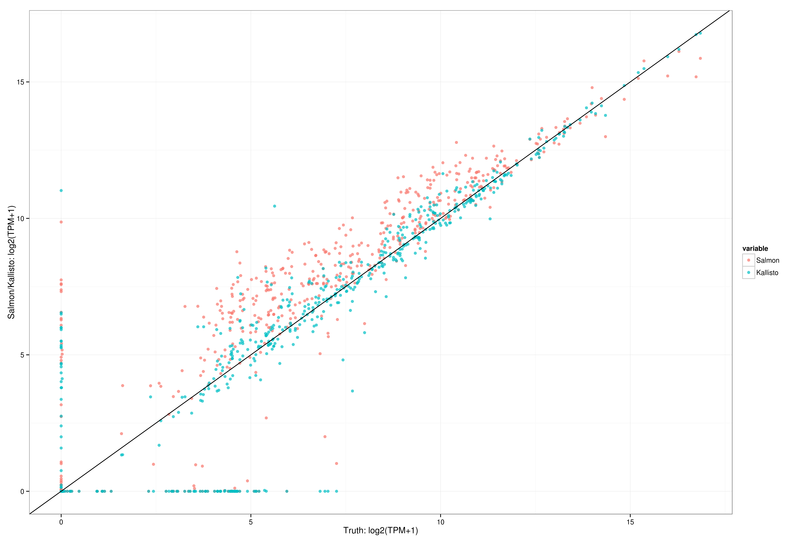 Correlation of Salmon counts with ground truth. The red line indicates perfect correlation. Correlation of Kallisto counts with ground truth. 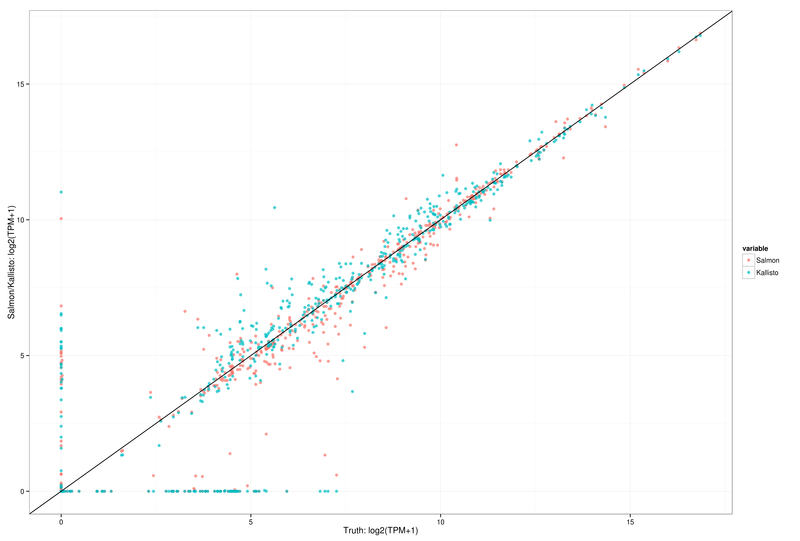 The red line indicates perfect correlation. I think both tools here are doing a pretty bang-up job — though Kallisto is performing better in this test, particularly with high abundance isoforms. 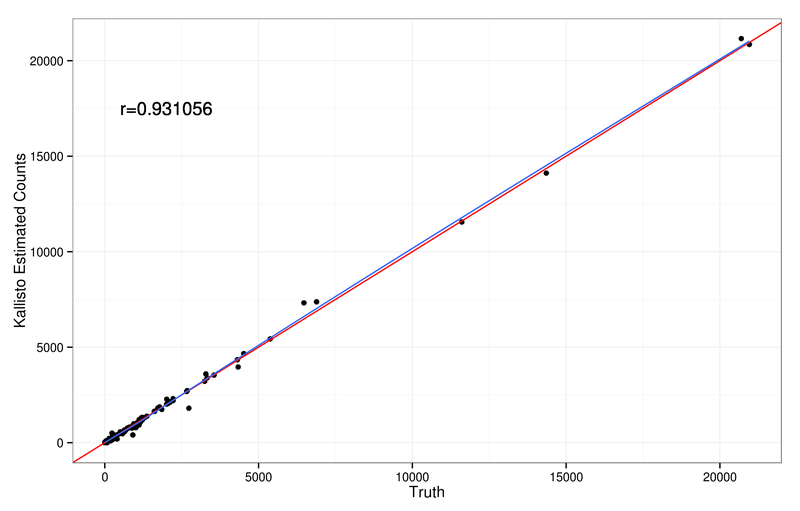 The correlation with ‘truth’ is stronger (Spearman, reported on the graphs above), as is the mean absolute difference from truth (10.04 for Kallisto, 60.66 for Salmon). Both Salmon and Kallisto are still under active development (Salmon has not yet been published, and Kallisto is only just in pre-print), so this is actually relatively early days for quantification by alignment-free methods (see this post by the Salmon developer Rob Patro for some potential future directions). 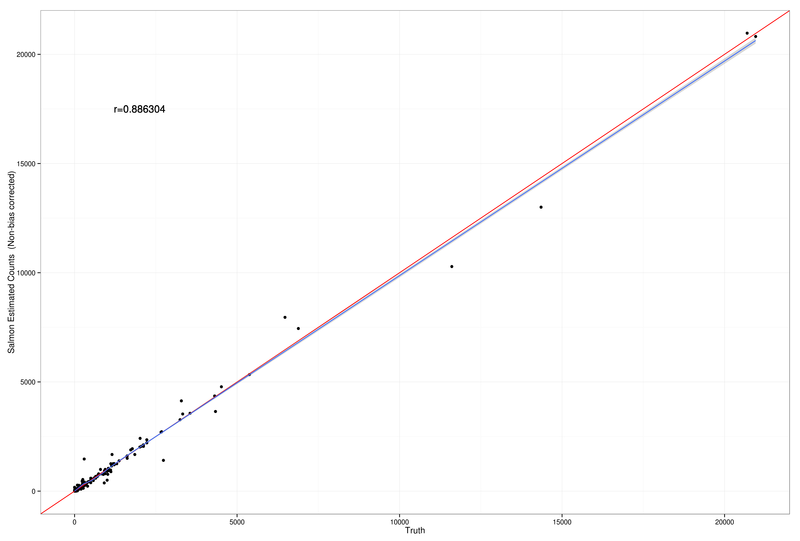 The fact, then, that both tools are already doing such a good job of quantification is very exciting. 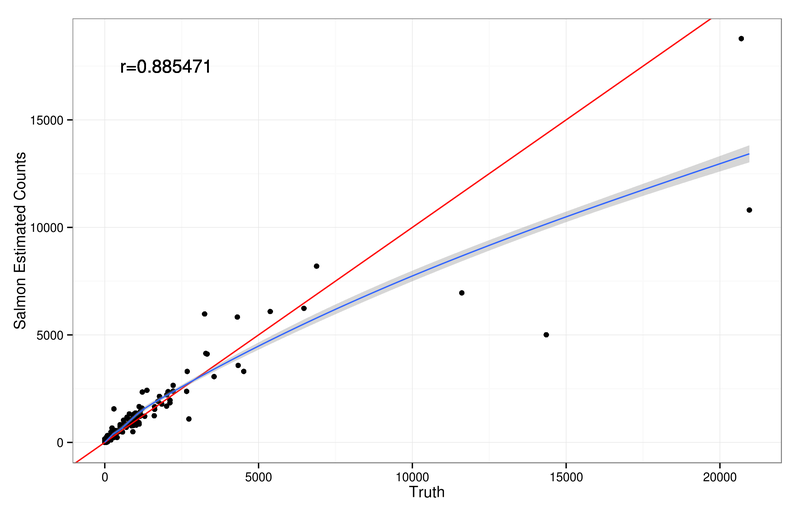 In response to the comment from Rob Patro below, I’m including a graph of the comparison of TPM (Transcripts Per Million) – again, truth vs Salmon & Kallisto, this time in one figure. Transcripts per million comparison. Graph is of log2(TPM+1). Now, this list may be a little flippant in places — but it is intended to make a point. There are no hard and fast rules about what a bioinformatician is and isn’t, the label will mean different things to different people. But what it does involve is an unusually wide skill set, usually hard-won over many years, and the knowledge of when and where to apply those skills. It definitively doesn’t involve looking down on hardworking partitioners in the field purely because they don’t fit your elitist mould — the only thing this is likely to do is exclude those interested in the field, but who don’t fit your preconceived ideals. If you want to let me know what being a bioinformatician means to you, feel free to comment below. After years of renting a VM from first Slicehost, and then Rackspace, I’ve finally taken the decision to change my web hosting arrangements. This site is now hosted at wordpress.com. I’m in the process of tidying things up and consolidating what was a confusing tangle of a web presence that had evolved over a number of years. The move to a hosted blog, rather than self-hosting, means that stuff is certain to be broken in older posts which rely on plugins I’m no longer able to deploy. I’m not promising a massive uptick in activity or anything, but at least things should be a bit more organised now. This is a cross-post from the Blogging for Science Online London group blog. During the Saturday workshop at Science Online London 2011, a bunch of us wrote content relating to Spinal Muscular Atrophy. My post was a short summary of a small scale drug trial, which shows promising results. This is a summary of a paper that shows that Salbutamol promotes SMN2 expression in vivo [cite]10.1136/jmg.2010.080366[/cite]. Patients with Spinal Muscular Atrophy (SMA) have no functioning copy of the gene SMN1. The SMN2 gene can theoretically function in its place, but a change in this gene means that only a small amount of functional protein is produced from the gene. 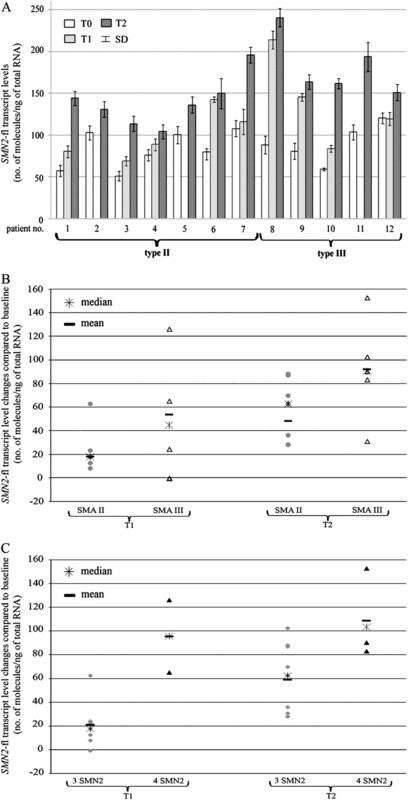 It is therefore suggested that any intervention that can increase the level of functional SMN2 transcript could well be effective as a treatment for SMA. Salbutamol is a short acting beta-adrenergic agonist that is primarily used for treating asthma. A previous study [cite]10.1136/jmg.2007.051177[/cite] has shown that Salbutamol is effective in raising SMN2 full length (SMN2-fl) levels in cultured SMA fibroblasts. In this study, the researchers administered Salbutamol to 12 patients with SMA, and measured the levels of SMN2-fl 3 times (0, 3 and 6 months). The levels of SMN2-fl were significantly increased in all but 3 patients after 3 months (average increase of 48.9%), and in all patients after 6 months (average increase of 91.8%). They also showed that patients with more copies of the SMN2 gene (some patients had 3 copies, some had 4) showed a larger response to Salbutamol treatment. This increase in expression cannot be explained by normal fluctuations over time in these patients, since studies have shown that levels of SMN2-fl are usually stable over time [cite]10.1212/01.wnl.0000252934.70676.ab[/cite] [cite]10.1038/ejhg.2009.116[/cite]. Clearly the big question now is whether this molecular response to the drug is reflected in a beneficial clinical response in the patient. This study does not address this question, but does propose that a full double-blind, placebo controlled trial should be carried out to ascertain whether or not this treatment is effective in treating the symptoms of SMA. Official details are below, or you can find the full ad on the Newcastle University website. The Bioinformatics Support Unit at Newcastle University is a successful cross-Faculty service providing high quality scientific support for a range of bioinformatics projects. We require an Experimental Scientific Officer, with experience of a range of Bioinformatics techniques, to work in the Unit on the development and delivery of scientific projects and liaison with relevant academics. You should have at least a first degree in a relevant science related subject and preferably a PhD. You will have previous experience in bioinformatics support and an understanding of UK research funding procedures. For an informal discussion on this opportunity, please contact Dr Simon Cockell (Senior Experimental Scientific Officer). The BSU website is a useful source of information on the kind of work we undertake. There’s a lot of analysis of high throughput data (as you would expect), but also opportunities to get involved with projects that have a bioinformatics research base. We support groups across the university, and beyond – in other north east universities and the local hospitals.